Wharton-Smith Breaks Ground on Center for Accelerated Training (CAT) at Valencia College's Osceola Campus | Wharton Smith, Inc.
Sanford, FL – April 24, 2018 marked a significant day for Central Florida with the groundbreaking ceremony for Valencia College’s new accelerated training buildings that will help grow Central Florida’s workforce. Valencia’s President Sandy Shugart addressed the large crowd gathered on the Osceola Campus saying “There’s nothing wrong with access to the workforce, what’s wrong is that it’s stuck there. If you want to work at all in Central Florida, you can get a job — you can get two or three, and you might need them all because at $8.50 or $9 an hour, you cannot sustain a family. It’s okay to start there, but it’s not okay to stop there,” he explained. “We were looking for a solution, and what we discovered is employers face massive shortages in construction and manufacturing. 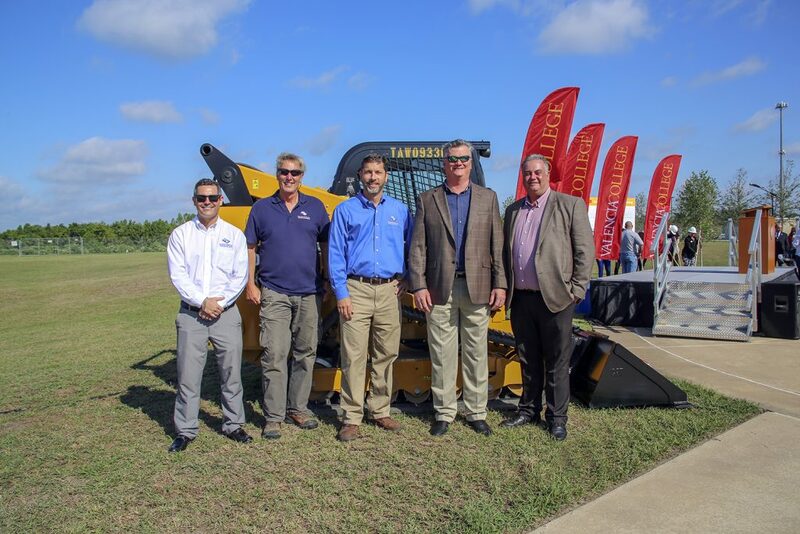 We began to think there’s an opportunity here to create short, low-cost intensive training programs people can take advantage of,” Shugart added. Words of excitement were also expressed by Valencia leaders Kathleen Plinske, President of Valencia’s Osceola and Lake Nona Campuses and Joe Battista, Vice President of Global, Professional and Continuing Education. Government officials including Osceola County Commissioner Fred Hawkins were also on hand to give their support and enthusiasm for the new facilities. The new $4.5 million Center for Accelerated Training (CAT), designed by the DLR Group, is a 14,700-square-foot facility offering short-term job training programs for construction, heavy equipment, transportation logistics, warehouse packaging, clinical medical assisting and private security. Wharton-Smith will provide construction management for the new facility, which is expected to open in January 2019. The College is also building the Careers in Industry & Technology Building (CIT), a sister facility offering associate degree’s for residential property management, engineering technology, hospitality and tourism management and criminal justice technology. “Shortages of skilled workers is something that we are faced with every day,” remarked Darin Crafton, Executive Vice President for Wharton-Smith’s Commercial Division. “We commend Valencia College on their vision to help address this challenge and we are proud to have a part in making this happen,” he added. Copyright © 2015 Wharton-Smith, Inc. - All Rights Reserved.